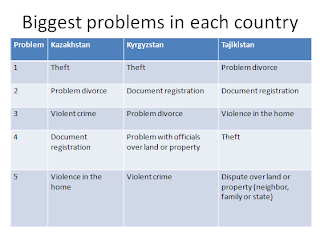 We looked at what respondents thought were some of the biggest legal problems that individuals in their country faced. Divorce figured prominently among those, making women's access to justice particularly relevant. 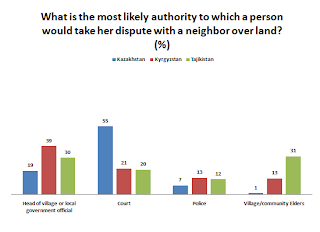 We also asked who inviduals would turn to on various issues, when there were problems. You see sharp differences between the countries. 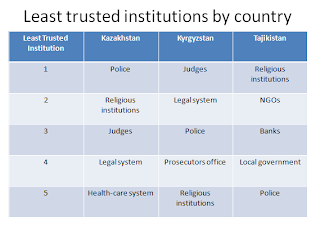 And we dug deeper, within the countries, to understand how people looked at the courts. Again, here a preview. 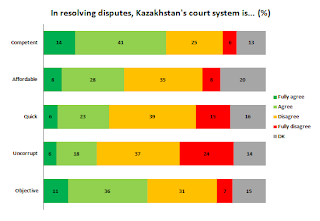 It suggests that according to Kazakh citizens, competence is not the main problem in the courts. The first presentation of results will happen on February 15 in Almaty (sorry for the short notice, but if you were likely attendee you probably received a separate invitation), and a more detailed report is out soon. Drop us a line in case you're interested in a preview, in exchange for giving us some feedback on it.